Shelley Henry of Gatheress is holding ground for us during this weekend's giveaway. She is a long-time SouLodge sister and deep desert relative. I have been dousing myself in her Raindance and Datura blends and have found both to be shapeshifters, reminding me of the landscape near her Phoenix homeland-warm and fierce, with subtle shifts taking place throughout the day. When I wear her oils, they feel as if they are working together with my chemistry, adjusting and balancing polarities all day long. They, and Shelley, exude MAGIC. It's a huge blessing to interview her in this space. Thank you for your good medicine, Shelley! 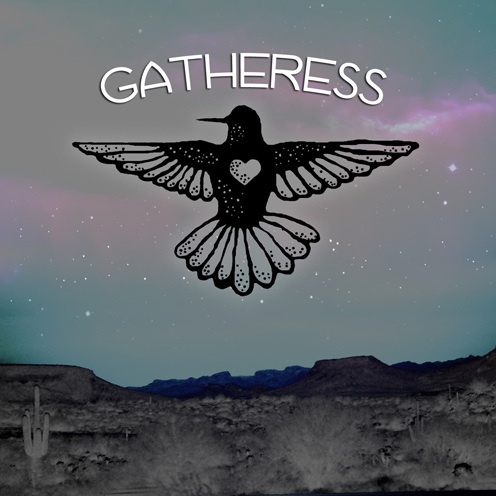 Today I'm giving away two of the desert inspired aromatics I have created for Gatheress. Both of the giveaways hold special magic, as people who have spent anytime in the desert will remember, the smell of rain on the dry earth, the scent petrichor. The first fragrance can be found in the plant known as creosote, chaparral or botanically as Larrea tridentata. It is the most common plant in the desert near my home and it seems so magical to me that a plant in the desert is the keeper of this fragrance. The winner of this item will receive The Gift of Petrichor, 10 ml LARREA + a creosote wand. Also being shared is one 10 ml bottle of RAINDANCE Botanical Perfume. This perfume invokes the warmth of the desert summer and the thrill of a monsoon on the horizon. It is the dance the desert dweller does with the elements seeking shelter from the sun and craving the rains to come. I am a multi-passionate creative butterfly, Arizona native and "born-again Botanist". I spent much of my early life feeling really connected to nature & the outdoors. My childhood summers were spent exploring the wilderness with my grandparents. They lived in a cabin in the woods an hour from civilization with no running water and only a generator for power. During one of those summer visits I made friends with an Alligator Juniper tree and I spent hours sitting next to her. Any messages she may have shared with me are long forgotten but my whole family knows "Shelley's tree". My early love affair with plants eventually led me to work in an herb shop as a collage student and ultimately to study Botany in graduate school. What were your motivations for creating a botanical collection of your own? Gatheress was born out of a need I had to root down and reconnect with the ground under my feet. So often people think of deserts as barren inhospitable places but those of us that inhabit these places know it is not the whole truth. Deserts are vibrant places inhabited with survivors and a glorious amount of sunlight. I want to share the medicine of this place and in the long run I aspire to use only plants that grow nearby and not exotics from around the world. It is more sustainable and I want Gatheress to celebrate the wild beauty of Sonoran Desert and to share that with the world. It will be a while until I am gathering local plants and making my own essential oils but that is where I am headed. What inspires you to create your synergistic blends? I am inspired by the world around me and the things I see in my daily life, a plant that is in flower or the scent of the air just before a monsoon. This season with Talisman Circle I'm shifting my focus a bit to explore the interplay of the elements; Air, Fire, Water & Earth and to see where that takes me. I am curious to learn more about the elemental energetics of the plants around me. What is your relationship to your work? How do you love it and how does it love/take care of you? I really feel like I have just grazed the surface of my work. As I dig deeper and open myself up more to it, I feel more deeply connected to myself, my intuition and my creativity. I also see it seeping into other areas of my life, for example my family is showing in interest in facets of what I am doing. This is expanding my vision far beyond what I originally intended and in wonderful ways. The conversation is just beginning, but the next year holds so much potential and I am really excited to see where it will take me. Do you have any special rituals or a sacred practice that you engage before you get to work? I work very intuitively and I pay attention to the moon cycles and the wheel of the year but really the plants lead me . When they are ready and plentiful the work begins. I leave offerings to the plants all the time even when I am not harvesting something. When I created the scent Datura the plant was in full bloom in my yard and the hawk moth larva were feasting on her leaves. I sat with her to listen and to learn what gifts she wanted to share, I left herbs and small stones for her. There is not actual Datura extract in the fragrance as it can be toxic but it is very much infused with the spirit of our conversations. Mmm vibrational medicine. So potent. What do you love about making magic? Because I spend so much of my time working in solitary I feel really blessed to work in collaboration. I love the degree to which people are willing to open up and be transparent. The scents that are created become so much more than a perfume made with favorite scents. They transform into sacred talismans that connect people to their own path. Leave a comment to enter, and if you feel called, share a bit about your relationship to the Plant People-to which do you feel a strong connection? We'll select two winners on Sunday! Meanwhile, enjoy 10% off in the Gatheress shop until March 01, 2013 with coupon code LOVESONG.